Roula Jouny was selected from a shortlist of several major companies and players to receive the prestigious and coveted award at the World Travel Market 2018 London exhibition. 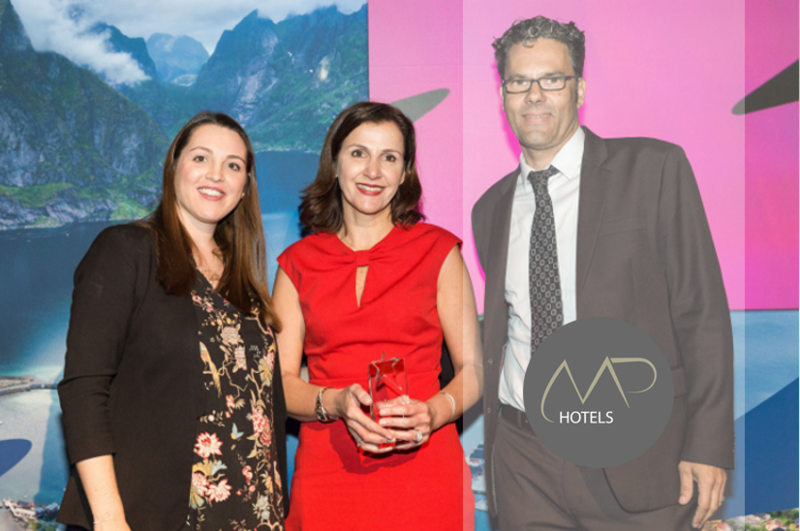 Munich – Roula Jouny, CEO of MP Hotels and Chairperson of Meeting Point International (MPI) , has been awarded the International Travel & Tourism Award 2018 for Outstanding Contributions To the Industry. The award was presented on November 6, 2018, by the World Travel Market conference in London. This honor is given to the individual or organization that has contributed the most to the international travel and tourism industry in the past 24 months. Jouny was one of 10 candidates, and the only woman, shortlisted for this award. Other competitors included major airlines, CEO’s from growing and established hotel and travel companies, as well as other top tourism related service companies. Social Responsibility is on the top of Ms. Jouny and MP Hotels’ agenda. Last year MP Hotels announced the incorporation of Malaika Linen, high-end handcrafted bed linen and towels, made from 100% Egyptian cotton at KAIRABA Hotels & Resorts and Design Plus Hotels. Furthermore, last month Meeting Point International inaugurated The Egyptian House in El Gouna. This venture acts as a catalyst of social responsibility, as it collects funds to support various charitable projects in Egypt. Proceeds of The Egyptian House are directed towards the Association for the Protection of the Environment (A.P.E). The latter is a private voluntary organization established in 1984 whose mission is to promote eco-friendly practices, plus other ethical enabling projects. A.P.E’s work can be split into 5 areas: empowerment of women, child protection development, health support services, recycling and community upgrading. The organization works towards strengthening these focus areas in Egypt by carrying out a wide array of programs, such as with the sewing training program for women used by Malaika, a child literacy initiative, a preventive infant mortality program, a center production of recycling machines, and a housing project in Tora, among others. Watch a video below or click here. Visit us on MPHotels.com, connect with us on Facebook and Instagram.